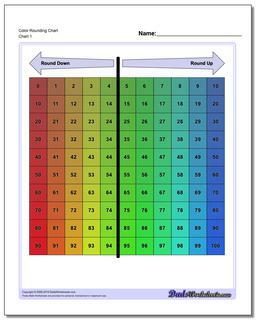 Use colors to make rounding numbers a bit more interesting. This hundreds number chart uses colors to help guide students when rounding off numbers. If you imaging rounding as a math skill that begins with locating numbers on a hundreds chart, then these color rounding charts will be a fun step in the right direction. We often use rounding as a way to simplify several numbers in a group so that we can more easily perform an operation on them. For example, if you had a set of numbers that you could round to the nearest ten's palce, adding those numbers up in your head can be a lot less daunting. If the volume of numbers is reasonable and the numbers are evently distributed, the error due to rounding will gradually reduce. However, rounding comes in to play in many other activities including measurement. When science class comes knocking, it's important that rounding skills were mastered previously in lower grades. Rounding numbers is skill appropriate in early grades after the introduction of place value concepts and is specified as part of Common Core (specifically, CCS.MATH.CONTENT.3.NBT.A.1) for introduction in third grade.